When I go to the beach with my children each August, it is always so relaxing. The sounds from each time the ocean touches the sand, seem like a song in another language, the meaning of which is so deep that we will never be able to understand. The sea gulls are flying around the beach, looking for any food that the sea will bring to them. Is there any message from the seashell? We know that every summer is the same on the beach, with sunshine and seagulls, even though the world changes all around us. 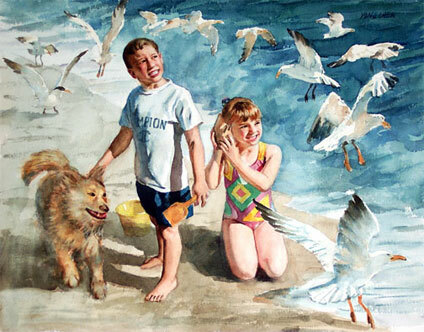 Dog in my watercolor painting "making friend"
Three spotted dogs in my watercolor painting "The New House"
Dog in my watercolor painting "Beach Fun"
Dog in my children's book "Starfish Summer"